It is impossible to overestimate the importance of Stuart Hall's work in shaping the field of racial and ethnic studies for nearly five decades. 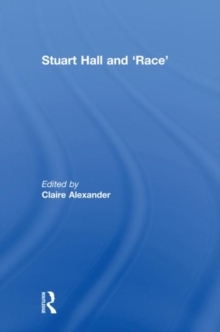 From his groundbreaking work Policing the Crisis through to his paradigm shattering `New Ethnicities', Hall's writing has redefined how race research is thought and done, while Hall himself stands as an exemplar of the public and politically engaged intellectual. This collection of essays, from established and emerging scholars, critically engages with Hall's legacy across this body of work, from the foundations of cultural studies as a field of enquiry, through his work on race and articulation, to his insights into `the politics of difference' and diaspora identities. These essays both reflect back on Hall's interventions and locate them within some of the key spaces and questions of our time - from the `political theology' of race in South Africa to the terrain of the contemporary city, from reflections on memory, nationhood and belonging to new ethnicities online and the formation of postcolonial subjectivities. The collection includes an in-depth conversation between Les Back and Stuart Hall, in which Hall reflects on his career and explores the challenges facing contemporary multicultural, multifaith societies in a globalised world. This book was published as a special issue of Cultural Studies.